– Waiter! I’ve been eaten and drunk! – Do you use internet? – I must complain! I look at adult site and all I see is children! If we suspect you drunk in this shop we will ask you to say “juxtaposition”. After I’ve been eaten and drunk I always feel like sh*t.
Limit your time in space. Juxtaposition Cafe = The Cafe of two feuds. How could I use the internet? I can’t even comprehend the Operator Destruction Mangle. @DNT 0431. Speaking of being drunk. He was still giggling about it, months later. He reckoned it sounded like something an ATM might say. 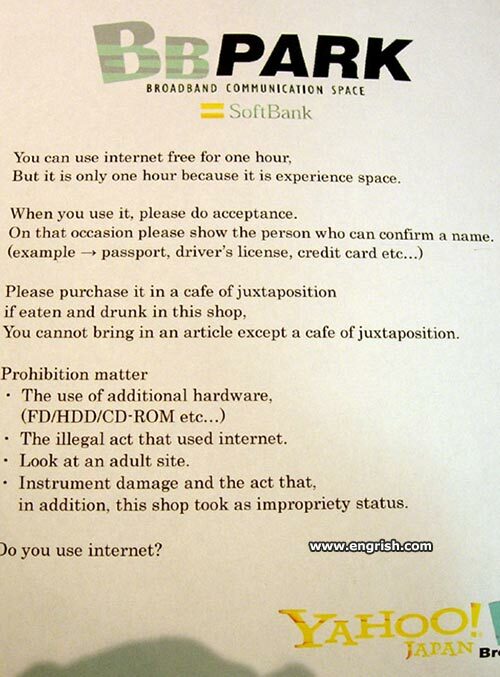 – If you will not allow me to use internet, I will not only bring in a cafe of juxtaposition and use an additional floppy disk and a fax machine, but I will also not be able to make any silly Engrish comments! Cafe of juxtaposition accomodates four feet. One may not begetting any interest. But the amount of Capital Growth, will more than make up for it.